Synthetic super-slick grease specifically formulated for the demanding requirements of bicycle bearings. Super-slick Teflon-fortified formula coats and protects ball bearings and races, preventing wear and corrosion. Works well in extremely stressful environments, such as in headsets and bottom brackets. Great for other applications - hub bearings, pivots, etc. 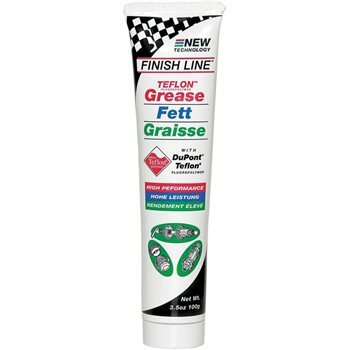 Finish Line's exclusive hydrophobic Grease thickening agent repels water and keep Grease stable even if totally submerged. Grease will not separate or decompose under extreme heat. The synthetic oils used are non-toxic and biodegradable, and the grease is non-toxic and environmentally friendly.